There is a school of thought that says Hull City played their first game in plain white shirts rather than the black and amber stripes which gave rise to their Tigers nickname. Prominent in this commonly held belief is a photograph of two teams, one wearing white shirts and the other in Notts County-like black and white striped jerseys, surrounded by dignitaries and posing alongside a smiling female who holds a large floral tribute. This image is usually captioned as depicting the pre-match formalities of the club’s historic first game on September 1st, 1904. But does it? Analysis of the photo reveals anomalies which cast doubt over the occasion it depicts, from the presence of Harry Taylor, captain of rugby side Hull FC, in the ‘whites’ line-up, to the absence of any readily identifiable City players. So if we accept that this photo wasn’t taken on the day of City’s first game v Notts County, then what game is it from? In January 1906, The Hull tug Star sank in the Humber, leaving two men, James Atkinson and Walter Brammer Ferndale dead and two families fatherless. In response, local politician, fancy-goods retailer, former Hull City director (and prominent supporter) S.T. 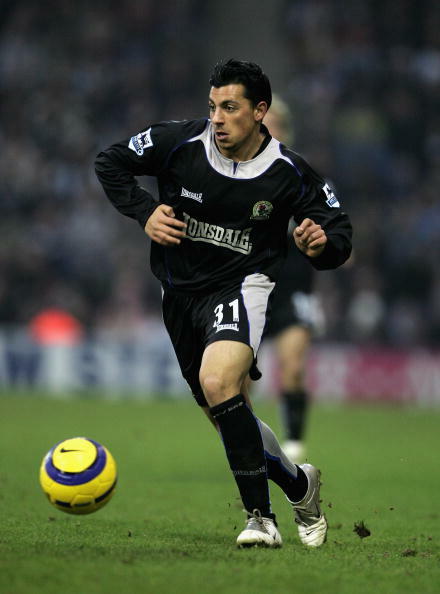 Smurthwaite used his energy and contacts to organise a fundraising game at the Boulevard for the families of the deceased. Through Smurthwaite’s connections, he got future City manager Fred Stringer to referee the game and Tigers trainer Bill Leach to run the line. At this time City were playing on the Circle cricket ground, but still had a lease to use the Boulevard. Their own Anlaby Road ground was nearly ready and would open in the March of 1906. The resulting fixture was a match between a Cyd Smurthwaite XI and the ‘Lady Madcap’ Company team. This unusually-named side were representing the theatrical company appearing in the musical comedy “Lady Madcap” at the Grand Theatre in Hull. The undoubted star of the company was Marie Studholme who was described in a local paper as ‘the famous musical comedy actress, the most photographed woman in the world and generally considered the loveliest woman on the English stage’. It was she who kicked the game off at 2.30pm on Thursday February 22nd 1906 and who features at the centre of the commemorative postcard by RC Garside, flanked by Smurthwaite in the white shirt. Next to him is Harry Taylor. To watch the twinkling of her feet. Were mine in watching such a Miss! Taylor would have needed no introduction to the city’s sporting public as captain of Hull FC. He had also represented Yorkshire and England in his sport, and in this game was playing in goal. Antony Starks of Hull Kingston Rovers had been due to play but had suffered a family bereavement on the morning of the game. Other players representing the ‘whites’ were Goodin, Stather (captain) Reid, Carney, Hopper, Bolton, Norman, Smurthwaite, Harper and ‘A.Special’. 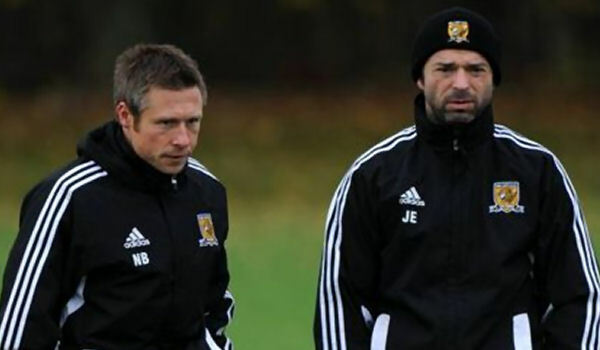 Matthew Carney and Walter Goodin were fringe players for Hull City that season. Carney played as centre half at Denaby in an FA cup qualifying game on October 28th and Goodin played as full back in the final league of the season at home to Lincoln City. Neither player was retained after the 1905/06 campaign ended. ‘A.Special ‘, possibly another City player, scored a hat trick in the game that ended 3-3. “We must thank the football club for the free use of their ground, the courteous secretary of Hull Football Club (Mr Charlesworth) for his great help, the Hull City club for the loan of goalposts, ball &c., Mr Stringer for officiating as referee and Messrs Harry Hampson, Leach and Coates for their help, and the gatemen of the Hull and Hull City Clubs. According to ‘The Fly‘ in the Hull Daily Mail’s match report the next day “the ladies of the ‘Madcap’ Company were busily engaged extracting hard-earned shekels from the male visitors, and even had the audacity to relieve me of 2d for a copy of the teamsheet. The flowers were selling well at prices which would make a florist’s mouth water”. A second Garside postcard depicts this fund-raising activity, with the ladies and their flower baskets. 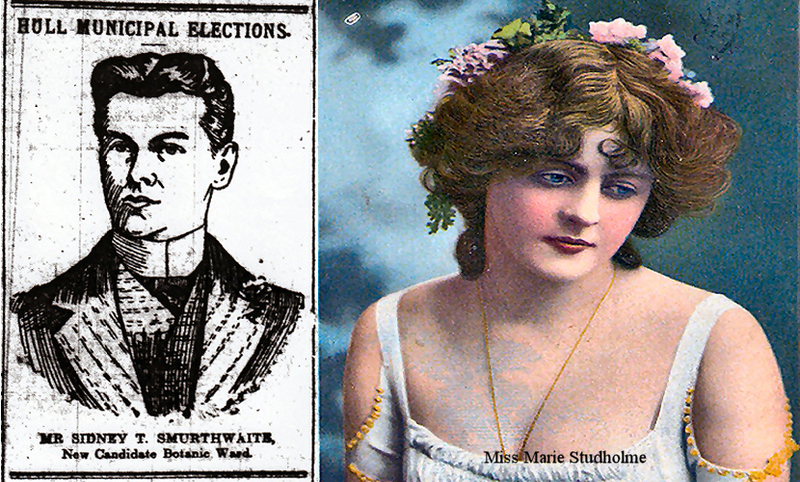 Marie Studholme also features in this card, and a smirking Smurthwaite has managed to position himself cross-legged at her feet. 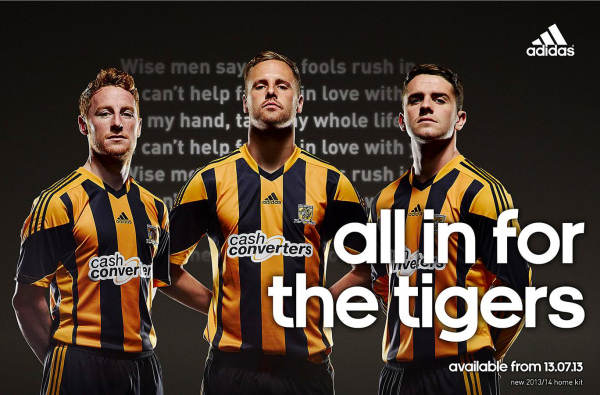 It can be concluded then that the photograph purported by many (including the club in programmes and on a large canvas displayed near the Chairman’s suite in the West Stand of the KC Stadium) to show the pre-match scene at the Tigers’ inaugural game, the basis of the common assumption about the first primary kit, in fact depicts a charity match that took place some 18 months later. What City wore in their first game remains unconfirmed. 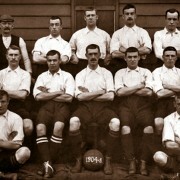 A team photo of City in white shirts, black ‘knickerbockers and stockings’ with the season year of 1904-5 on a ball could understandably be thought to corroborate the white shirts as part of the primary kit belief if the ‘Madcap’ game photo was instead from the first game, but even that photo needs to be put into a wider context. This team photo is just that, a team photo, rather than a photograph of the squad, as City used over 40 players that first season and the image has just 11 players and trainer Bill Leach. Those players are F Wolfe, J Whitehouse, J Turner, T Jones, W Martin, JE Smith, G Spence, P Howe, A Raisbeck, G Rushton and H Wilkinson. J Turner’s presence helps us narrow down when this photograph was taken, as he played just seven games for City, all of them consecutive and five of them at home. Of those five games, only two featured an XI identical to the team photographed in white jerseys: v Burton United on November 3rd and v Bradford City on November 12th. Burton United’s first choice kit in 1904/05 was a terrifyingly garish outfit of green and Indian red (a hue between pink and brown) quartered jerseys, white shorts and green socks, no clash with either white shirts or jerseys of black and amber stripes. Bradford City’s main colours though, would clash: The Bantams kit at that time was claret and amber striped jerseys worn with white ‘knickerbockers’ and black stockings. It is important to note that at this stage of Association Football’s development, there was no such thing as an ‘away kit’. The convention of the time was for the home side to change shirts in the event of a colour clash, it wasn’t until 1921 that the visitors were the team required to change after a Football League ruling. If the norm in City’s first season was to wear white jerseys then no change would be required, but the match report of the game makes a specific reference to the need for a change. The clear implication is that white shirts are part of a change kit, and not the first choice City kit. So whereas some believe the Tigers began wearing amber and black at the start of our first Football League season, the 1905/06 campaign, the club were in fact wearing the now familiar colours much earlier than that, perhaps even in the first game against Notts County. Certainly by March 1905 when Hull Daily Mail writer Athleo suggested the Tigers as a nickname based on the striped jerseys, though the Mail’s cartoonist was depicting City players (and even the H and C in Hull City!) in stripes some five months before that. The illustration shown here, drawn by RW Lawson, has caricatures of several prominent players from the club’s first season and trainer Bill Leach. There’s “Lightning Goal Getter” George Rushton who scored City’s first goals against Notts County, George Spence “The Skipper of the Crew”, H Wilkinson as “Wilkie on the Warpath”, ‘keeper Jimmy Whitehouse (wearing stripes, it wasn’t until 1909 that goalkeepers were required to wear distinct jerseys), Tom Jones who “returns the argument” and “Marcus Superbus”, or Mark Andrews, a teacher (and club director) who played eight times for City. His last appearance came on 29th October 1904 against Stockton. That game, a 2-2 draw, came a fortnight before the Bradford game and subsequent report which calls City “the wearers of the amber and black”. It would be absurd to assume that the cartoonist incorrectly drew striped shirts when City’s first choice kit included white shirts, so it seems safe to assume that ‘The Citizens’, not yet known as The Tigers, were clad in amber and black stripes by October, at the most just 59 days after their first game. We now know that the whites v stripes photograph is not from a Hull City game, and can reasonably deduce that the white shirted team photo is from a specific game when City were compelled to wear a change kit rather than representative of what was worn for the full 1904/05 season, leaving no evidence at all that the club did not wear amber and black from their outset. The nearest thing we have to a record of what Hull City wore in their first game is a photograph evidently taken on the day. As well as the XI that drew 2-2 with Notts County (lined up here in the order of Joe Leiper, Jimmy Whitehouse, Tom Jones, Billy Martin, Frank Wolfe, George Rushton, George Spence, Peter Howe, T McKiernan, Andy Raisbeck and Henry Wilkinson) it features some of the men who founded the club, Ben Frost, Ernest Morison, Alf Spring, Fred Levitt, Jack Bielby, James Ramster, Chairman William Gilyott, James Barraclough, Marcus Andrews, vice Chairman Dr. George W. Lilley and Ben Crompton. Also present are trainer Bill Leach and rather significantly, the Lord Mayor Alderman W. Jarman JP, who kicked off the first game, with his behatted beadle E Rodgerson. What the players appear to be wearing here opens up a whole new can of worms, as it seems they are wearing all black, but it doesn’t offer anything to support the white shirts in the first game theory, so we consider that school of thought expelled, totally debunked. So let’s consider what we see in this photo. It could be that they players are wearing training/warm up tops before the game and changed for the match, but that’s not a theory we are minded to subscribe to. Maybe the truth is hiding in plain sight. We consider it possible that City are wearing amber and black here, but that the print quality is so low that the lighter stripes are indistinguishable. Without further corroborative evidence we can’t say for sure, but our current belief is that City wore amber and black in their first game. No mention of what City wore against Notts County is given in the Mail’s match report, but since they’d previously announced what the club’s colours were, and that by November 12th they were calling City “The wearers of the amber and black” as if this was common knowledge, then there is little basis to assume we wore anything other than amber and black against Notts County. No Football League team wore all black between its formation and City playing for the first time, so a team intent on joining the professional ranks wearing monotone kits would be a notable occurence. The British Film Institute have a short motion picture on their website of a Mitchell and Kenyon (the Blackburn based film producers) recording that shows a City game from the 1904/05 season that could well be against Notts County, as City, clad in amber and black are playing a team in striped jerseys that appear to be black and white as worn by the Magpies in 1904. Only two of the teams that came to the Boulevard in 1904/05 were known to wear a kit similar to that seen in this video, Notts County and Derby. Grimsby might seem an obvious candidate, but in 1904 the Mariners wore brown and blue quartered shirts. There can’t be many games in a season of friendlies that were deemed worthy of filming (both FA Cup ties against Stockton were played away) though the first game seems a more likely choice than the visit of Derby. Sadly, Mitchell and Kenyon have captured only one half of the game, seemingly the second half if the manner in which the players take to the pitch is a clue, and not the pre-game activities which may have included Mayor Jarman kicking off, identifying it for certain as the Notts County game. The footage is still very useful though, it confirms what we suspected about City playing in amber and black before the start of the 1905/06 Football League campaign, and suggests that the first amber used was a very dark shade compared to what was used in subsequent years. The corner flags are striped, with the lighter bands not altogether distinguishable from the darker stripes, which lends credence to notion that dark amber stripes and black stripes, if worn in the team photo with the Mayor and club directors, would not be easy to make out on a very grainy photograph. In summary then, we know that white shirts were used as a change kit in 1904/05 but it was not the primary kit, and the balance of probability is that Hull City wore amber and black in their first ever game. Research by Nicholas Turner. His books Now Tigers! and Hull City in the 1920s should be on the booksheves of all Tiger Nationals.